The formula of sustainability in today’s NHL isn’t as strenuous as it’s made out to be. The league’s best teams almost always find ways to plug its holes by filling them with prospects or established players from within the AHL. They’re production is often overlooked mainly due to responsibility and playing time. When a player is recalled from the AHL, it’s usually to take on a small role — typically in the bottom six. Sometimes, one will take off and stay in the lineup a lot longer than expected. Others are relegated to the press box, looking down on teammates (a stark contrast to playing almost every game in the AHL). Of the league’s elite, the Tampa Bay Lightning have had ample success in this area. Few could have predicted Jonathan Marchessault’s rise from AHL regular to a first-line talent. But it’s unquestionably impressive how the Lightning have been able to keep its terrific core intact while subsequently surrounding those players with cheap, two-way depth. Alex Killorn, Ondrej Palat, and Yanni Gourde are the headliners here. The trio were developed at a slow pace, graduated to the NHL, and have since been rewarded for their play with long-term contracts. On a different scale, the Lightning have received contributions from draft selections Mathieu Joseph, Anthony Cirelli, and Adam Erne — three players that have thrived in lesser roles. Together, in a variety of situations, this group has combined to a game score of 3.76; an awfully good mark for bottom-six regulars. On top of drafting well, the front office has done a hell of a job locking down its core of Steven Stamkos, Nikita Kucherov and Victor Hedman, with breakout star Brayden Point as the next one due for a significant raise. The Toronto Maple Leafs are nearing some tough decision making of its own, with general manager Kyle Dubas confidently pronouncing these words earlier in the season when he was asked if the organization will be able to keep all of William Nylander, Auston Matthews, and Mitch Marner together for the long run. “We can, and we will,” Dubas now famously uttered. As of now it’s three down and one to go with Marner as the last member of the big three due for a contract. Much like the Lightning, the Maple Leafs are attempting to ease the transition from entry-level based salaries to restricted free agency by filling out the rest of its roster with cheap talent. 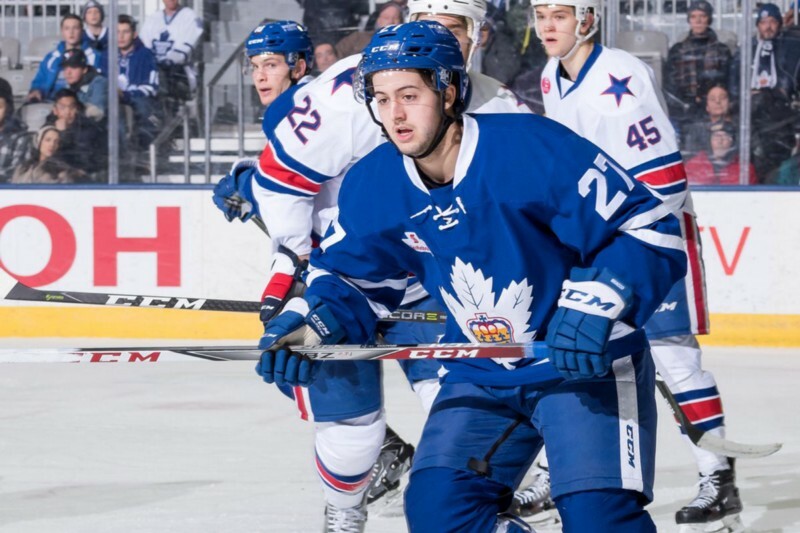 Behind the scenes, the Toronto Marlies are playing a key role. Up until Brendan Shanahan’s arrival, the Maple Leafs struggled to help out its parent club by developing players and preparing them for the NHL. It wasn’t until a proper rebuild took place that the Marlies were utilized properly. And that is where we are at now. With good players in place, the Marlies and head coach Sheldon Keefe have thrived. Backed by current Maple Leafs forwards Andreas Johnsson, Frederik Gauthier, and Justin Holl, to name a few, the Marlies rumbled its way to its first-ever championship in 2017–18. Johnsson, who has flashed considerable upside in his first full season with the Maple Leafs, won Calder Cup playoff MVP. His rise from 7th round draft pick to one of the league’s best rookies is proof the importance of an AHL team should never be overlooked. Last season I wrote about Kasperi Kapanen and Johnsson’s imminent arrival to the NHL as the pair were lauded for their play with the Marlies. At the time, the Maple Leafs were rostering James Van Riemsdyk — who eventually earned a considerable raise with Philadelphia— and Leo Komarov as pending free agents. The point of that piece was to shine a light on something similar to this one, in that the organization has the depth to let players like Van Riemsdyk and Komarov walk in favor of younger, cheaper options in Johnsson and Kapanen. There comes a time when the “cheap” label dries out and that clock is ticking in Toronto. Similar to Marner, both Johnsson and Kapanen are restricted free agents for this first time this summer. Whether the Maple Leafs trade one or keep both remains to be seen, but it’s almost a guarantee that the front office will aim to sign Kapanen and or Johnsson to contracts with an AAV less than $3 million per season. Both players have been good this season, with Kapanen thriving early on when Nylander wasn’t around and Johnsson — who’s been the team’s best left winger — producing despite a puzzling amount of limited ice time. Dubas has already tried to get ahead of the cap crunch and it’s come in the form of two minor contract extensions to Marlies regulars Calle Rosen ($750K ) and Trevor Moore ($775K — both until 2021). Though less flashy, Moore and Rosen are lower-tier options that the organization will look to for production in the bottom-six and on defence. The Maple Leafs are expected to lose three defencemen to free agency with Jake Gardiner, Ron Hainsey, and Martin Marincin and there’s no guarantee that Igor Ozhiganov (RFA) returns, either. There’s going to be a lot more work to be done here but Rosen’s extension indicates, at least early on, that he should be in the mix for next season, joining Morgan Rielly, Jake Muzzin, Travis Dermott, Nikita Zaitsev, and Holl. Rosen had his usual ups and downs in 2017/18; his first full stint in North America. He adapted and took off in the playoffs, scoring 11 points (five goals) in 16 games en route to the title. This season, Rosen has been that much better. In 41 games he’s already surpassed last year’s regular-season point totals (36) and has established himself as Keefe’s best defender, at least in terms of offense. Rosen should be able to slot in as an adequate bottom-pairing defenceman and operate as a complementary piece. It’s also reasonable to assume other teams will show interest on the trade front. Moore is a little bit more interesting. The 23-year-old went undrafted out of the University of Denver and was later signed to an entry-level contract by the buds in July 2016. His ability to drive play was put on display immediately and after two-and-a-half seasons of productive hockey under Keefe, he was rewarded with a two-year contract extension. That should pave way for Moore to get an extended look in the Maple Leafs bottom six; a spot in which he’s thrived at the NHL level. In seven games, Moore’s Corsi For is 55.7 percent and his Game Score per 60 minutes of 3.59 is only second behind Tavares. That’s impressive for a player thrust into NHL action, especially if you factor in ice time (8:43 minutes per game). Here’s to hoping Moore’s fate won’t be the same as Josh Leivo, who was unfairly strapped to the press box for almost his entire tenure with the team (unsurprisingly, Leivo has been good in Vancouver. He scored his 11th goal of the season on Saturday). As things stand, the Maple Leafs benefit more with Moore in the lineup, particularly in place of Par Lindholm (whose current usage is baffling) and Connor Brown who, despite his best efforts, is replaceable. These two moves don’t move the needle too much but are necessary for building a competitive team from the bottom up, especially with franchise-altering decisions being made, and another on the horizon with Marner. If you’re a Dubas believer, the Maple Leafs should be able to sign Marner this summer without sacrificing too much in the long run. It’s likely to come at the cost of Gardiner, and it’s possible that one of Kapanen and Johnsson could be traded, but even if it plays out that way, the Maple Leafs will be in a good spot. The good coming from the system doesn’t necessarily stop there. While the Maple Leafs prospect cupboard is a bit thinner now, the club appears to have some other low-tier assets developing at a fast pace. Jeremy Bracco is leaps and bounds better than he was a year ago. His playmaking ability is front and centre with the winger leading the team with 30 assists in 39 games. That skillset alone could be what gets him to the highest level, perhaps as early as next season. Rasmus Sandin, last year’s first round draft pick, has also flashed some considerable upside with the Marlies and despite an early-season injury, 2017 first round selection Timothy Lilijgren continues to make strides, as well. There continues to be some debate over the Maple Leafs success at the draft table over the years but despite a fairly low amount of high upside players in the system, the Marlies are doing its job. That’s about all you can ask of your AHL team and Keefe, as well as this year’s group, deserve credit for helping shape the present, and future.